WINNIPEG, Manitoba/VANCOUVER (Reuters) – A decade ago, Canada’s oil sector was growing so fast it was predicted to become a global energy superpower, but a series of political missteps and formidable environmental activism has created a dysfunctional system requiring OPEC-style government intervention to move its oil to market. Greens and NDP need to merge, and we need to do more to stop the election spending race. 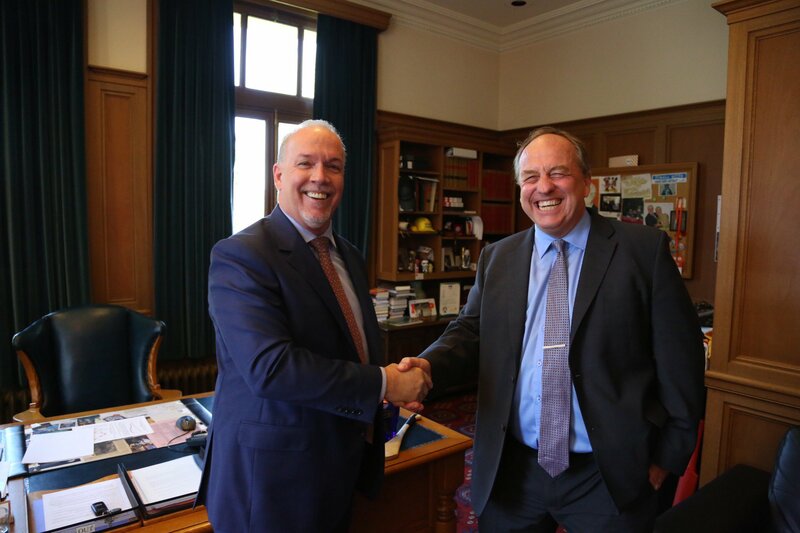 Greens and New Democrats are going steady under Premier John Horgan and Green leader Andrew Weaver. If they want to win under first-past-the-post, they need to tie the knot. Photo from John Horgan, Facebook. The voters have spoken. We can now leave proportional representation in the hands of countries like Sweden and New Zealand. When experts, such as engineers and geoscientists, submit reports on a project to B.C.’s Environmental Assessment Office, the generally accepted idea is that their information will reflect environmental standards and identify problems, allowing a project design to be changed or rejected if necessary. The British Columbia government has recently made two big decisions that are pulling the province in opposite directions in the climate fight — approving LNG Canada and rolling out the new CleanBC climate plan. The LNG Canada project is massive. It will sprawl from new fracked gas wells in northern B.C., across the coast mountains via the hotly-contested, 650 km “Coastal GasLink” pipeline, to a new liquefaction terminal in Kitimat. From there, the gas will be loaded onto supertankers and shipped to Asia. The LNG terminal is designed to be built in two phases, each of which will produce 13 million tonnes of liquid natural gas. The first phase is now going ahead.